I have had a couple of weeks off after a very stressful time at work, so haven’t been posting much this month. I have been up at Castlemaine and re-energising myself with lovely walks in the bush, sketchy walks of course. 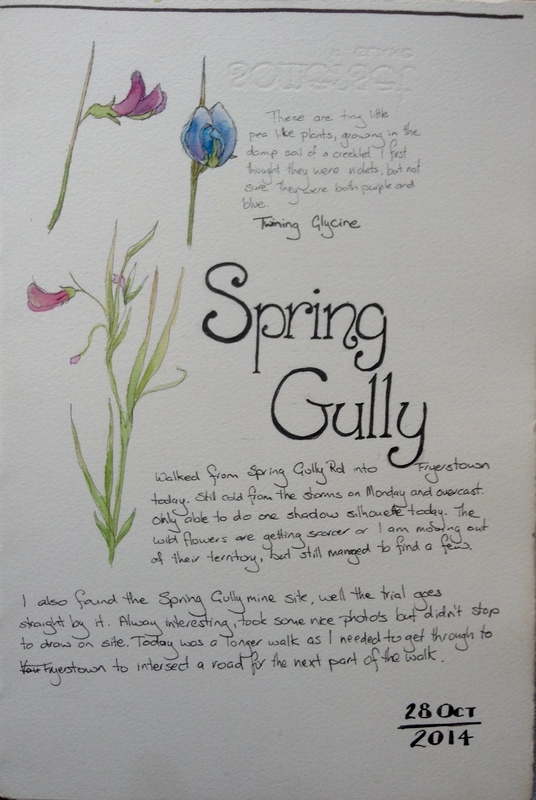 I have been catching the last of the main spring flowering and getting the confidence to do some larger drawings of the surroundings. 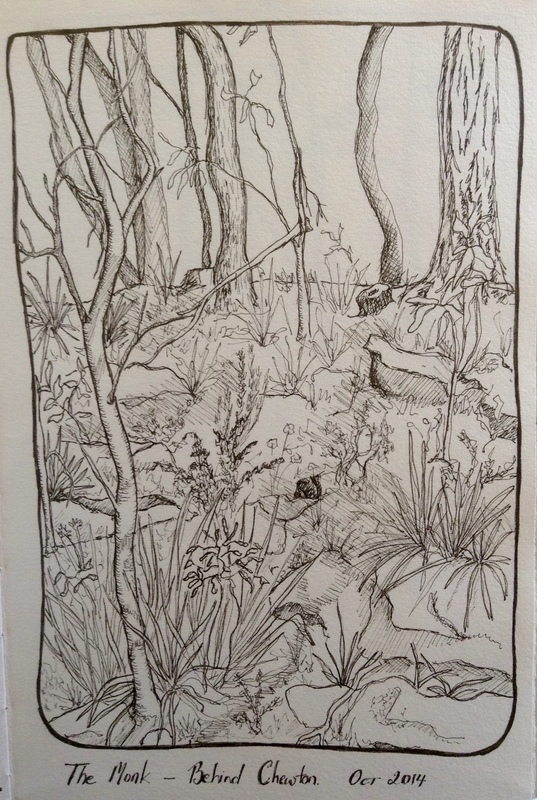 There is a stark beauty to the dry scrubby bush around here, but one that is difficult to translate into an interesting drawing. The picture of ‘The Monk’ above is my best effort to date and it gives me encouragement that I might be able to translate this beauty to the paper so others can see it. 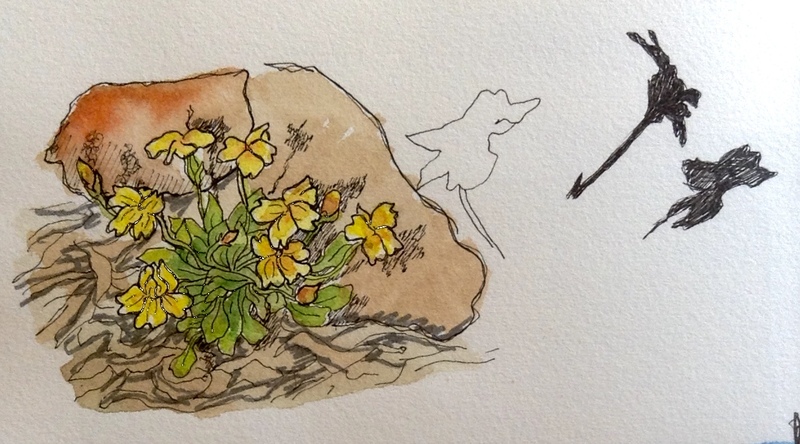 I am gradually going through and identifying the names of the flowers I am drawing, not as easy as it sounds, I think it takes me as long to identify them as to draw them, but found some really helpful blogs and websites in the process. The grasses are starting to flower and set seed now, not great for my hay-fever but pretty to see. 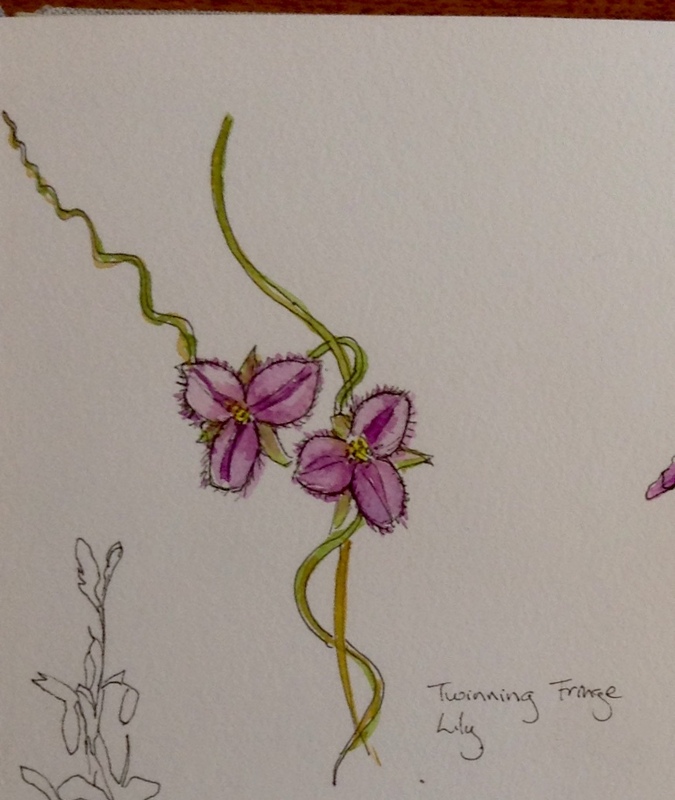 My favourite grass is what I have always called shimmy grass but is actually quaking grass. I think shimmy is a much better name as it conjures up dancing while quacking links to fear. This grass is definitely dancing in the slightest breeze. A few different types of everlasting are out, the one with the many branching florets is the grey everlasting while the other is a little button plant called Scaly Buttons. There is also a seed head of the Spiny Rush, which lives up to its name as the points of the leaves are really sharp. My best find was these tiny, little pea like flowers which were hiding in the grass called Twining Glycine. 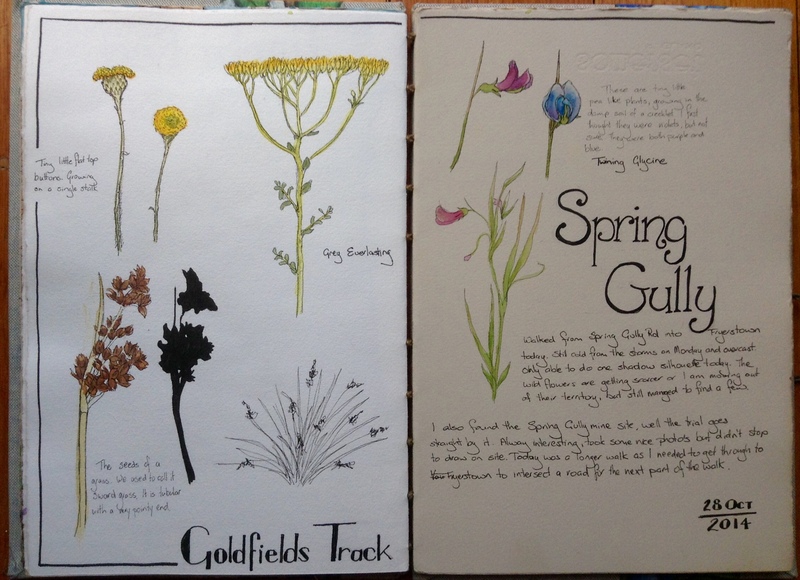 I haven’t been just drawing flowers in my sketchbook, I have started on some new works for an exhibition that I have been asked to join at the end of January. More news about this in the next blog. I was worried while I was away in Bali that I would miss the best of brief wildflower season at home. But I shouldn’t have worried as there were still plenty to be found and best of all the little bush orchids and lilies were out. 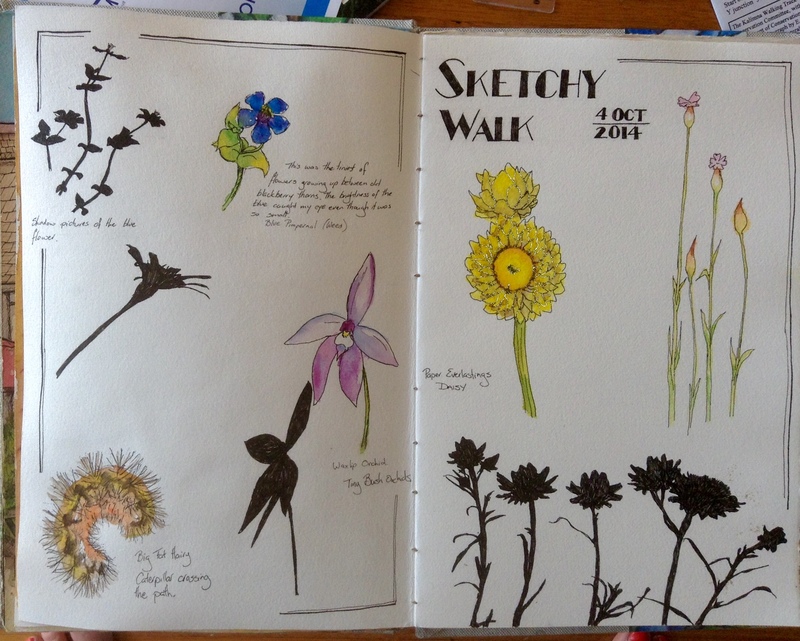 These sketches were done over the last couple of weekends on some lovely sketchy walks in the sun. I was first caught by the most amazingly vivid blue flowers in the grass, lucky they were so bright as they were tiny, little things. Most of these wild flowers are tiny, but just so beautiful when you get up close and personnel with them. You have to go walking so you are slow enough to be able to see them, shyly hiding in the grasses. There were plenty of the little waxliped orchids out, they come up singly on a long thin stem, and just nod in the breeze. For the first time ever, I saw a whole group of them together, it took my breath away and I was sure there would be fairies about. There were loads of paper everlasting daises and I found some other funny little flowers with long grass like stems, I was told they were weeds, just haven’t found out what type yet. Never mind they are pretty to me. 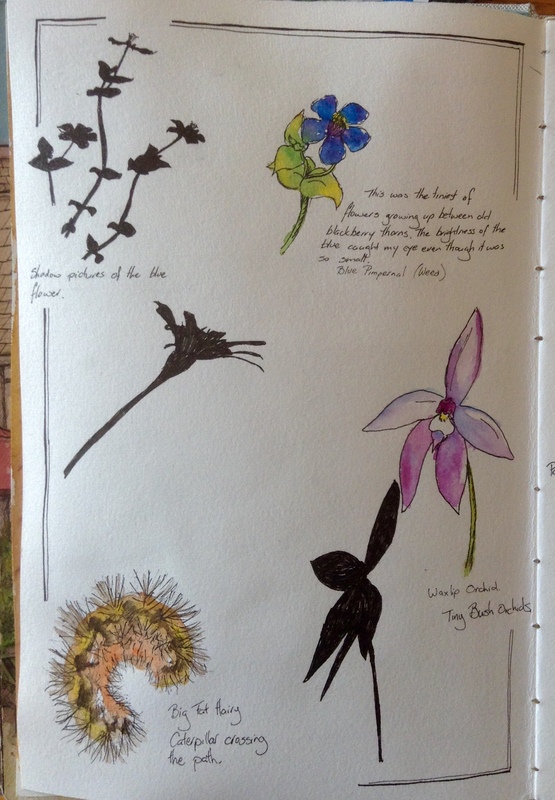 Because the sun was shining so brightly I also made little drawings of the shadows the flowers cast on my page. 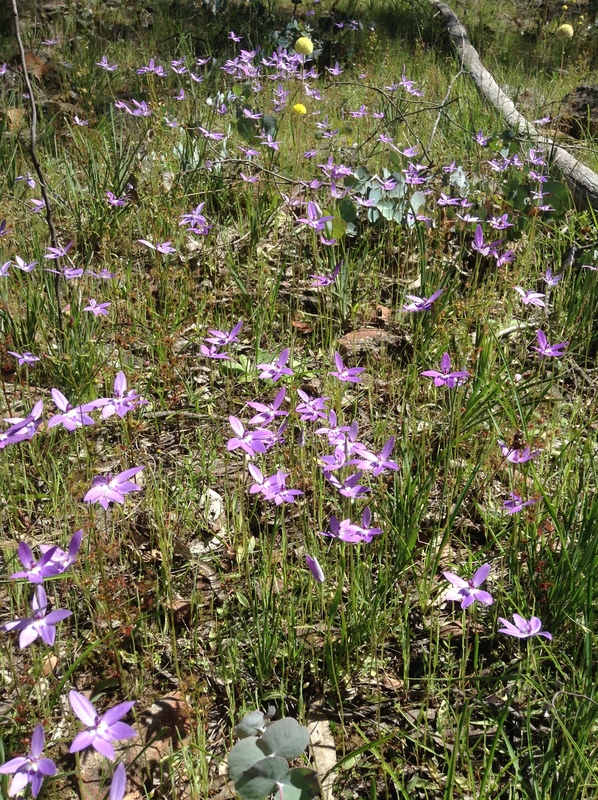 The following weekend I saw even more orchids and had the luck to run into a knowledgeable wildflower enthusiast beside the dirt track and he was kind enough to help me with my identification. 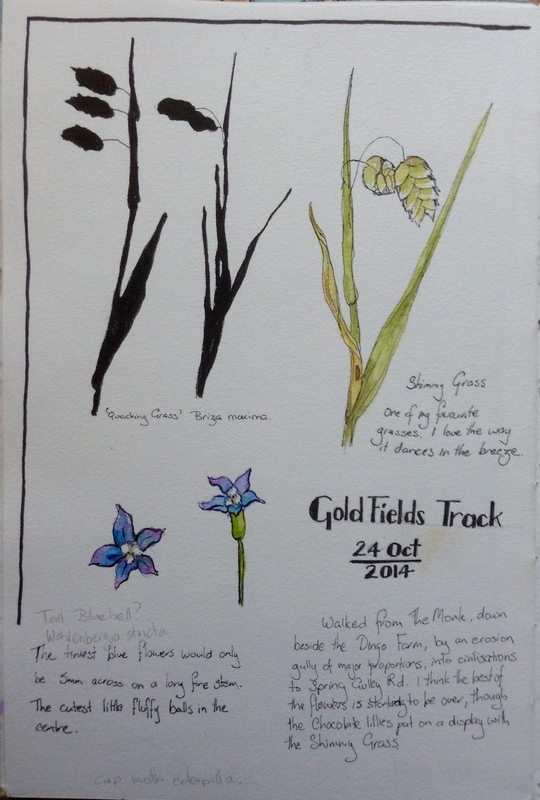 I was really pleased that my sketches were good enough to identify the flowers from! Here is the Twinning Fringe Lily, only about 7-10mm big and it twines up on other things and also the Chocolate Lily, with its nodding flowers on tall thin spikes. I also saw this little yellow flower which my new friend kindly identifies as a Bent Goodenia, what a great name and a cute little flower. 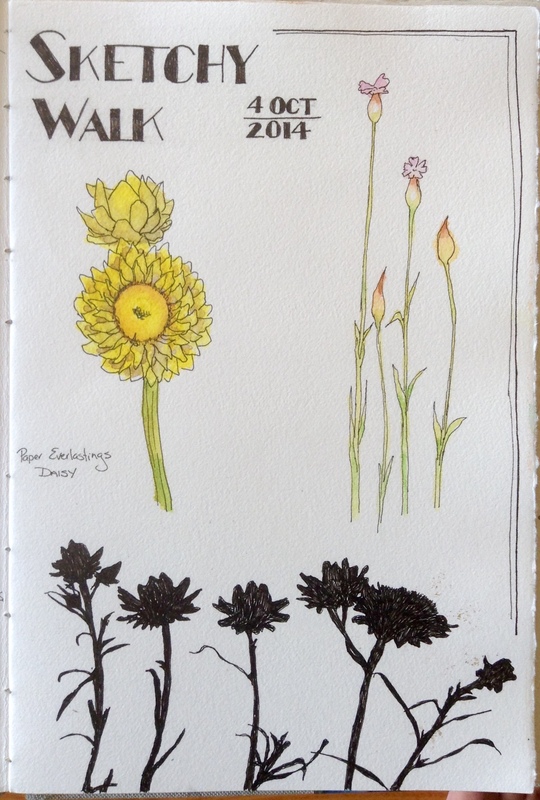 The yellow buttons that I drew in an earlier walk were going to seed, just like a dandelion so I just had to stop and draw these as well. 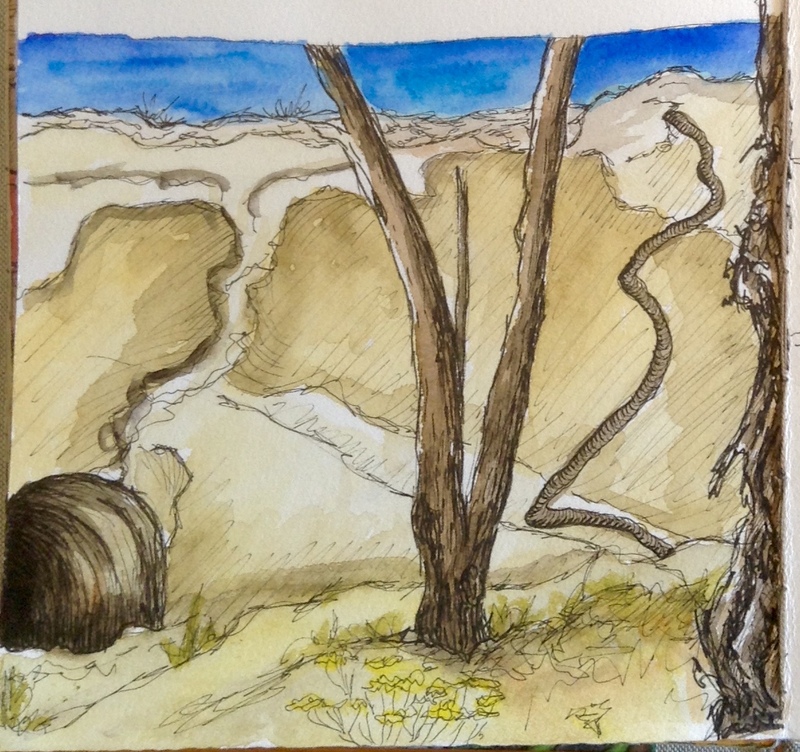 Here finally is a very quick sketch of one of the mines that still dot the landscape and remind us that this was once one of the busiest and richest minefields in the world. 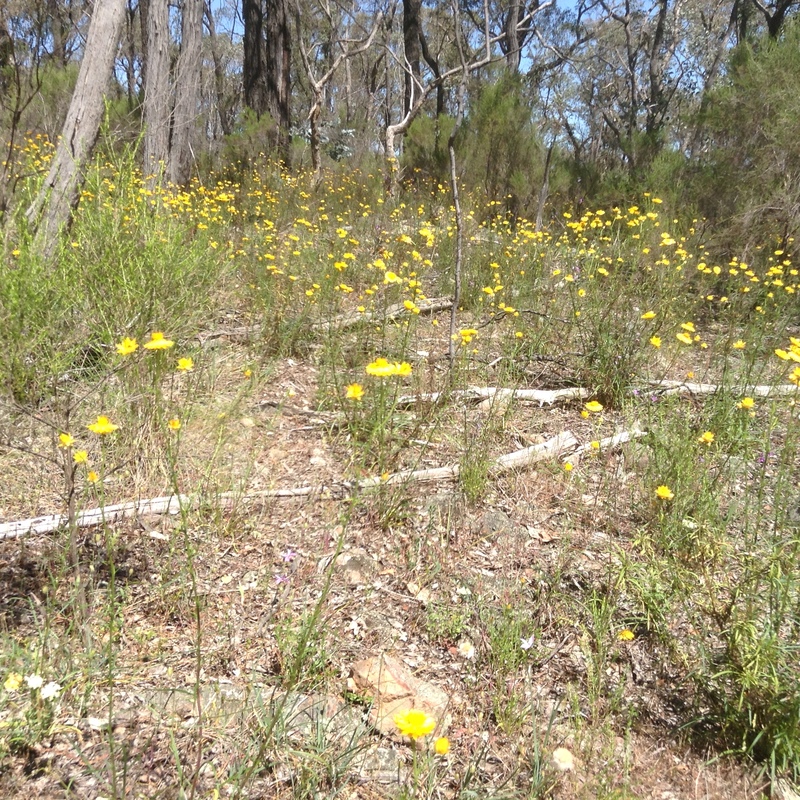 I will leave you with this last photo of all the yellow everlasting that were carpeting the bush, spring is so magical. Where I have been this past week. While I was busy working on my Bali sketch book I still managed to get some other work done. It is hard to balance all these projects, but a great deal of fun, definitely not bored at the moment. 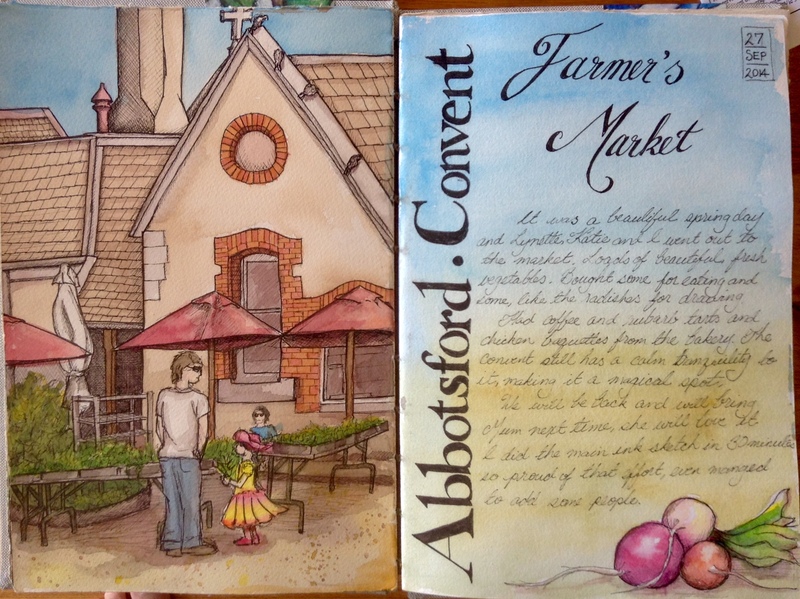 The weather has been lovely on the weekends and I finally got around to visiting a farmers market in the beautiful grounds of an old convent. It is one of my favourite places in Melbourne. It is near the river in these amazingly peaceful, old convent buildings and grounds. It is now a thriving arts and food area that just abounds with live. I always enjoy farmers market, it is lovely to be around people who are passionate about their produce and I adore looking and tasting all that great food. We shopped, ate and explored in the most beautiful sunny spring weather. 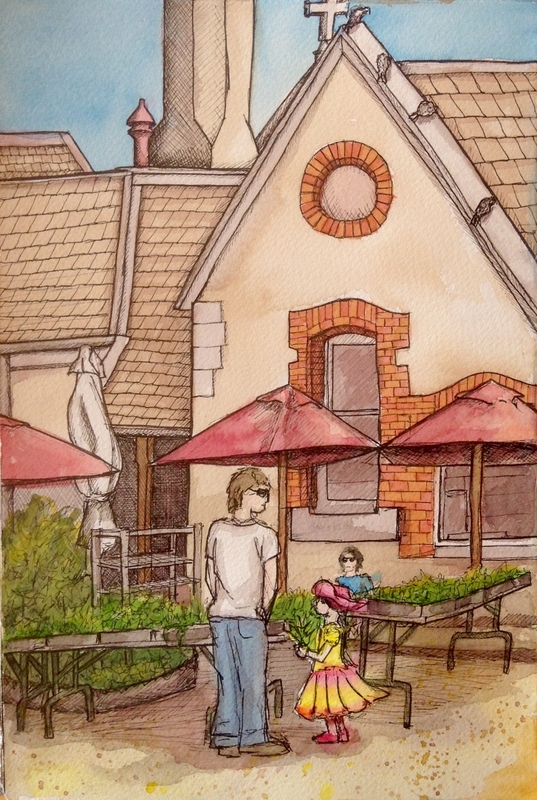 I managed to get a quick sketch in of the scene, even was brave enough to add people. Just couldn’t resist this cute little girl in her pink and yellow outfit. My sketching is getting better and I am managing to get much more down in a shorter time. Practice is really working! Also that week, we moved our office into the CBD and I finally have an office with a window and natural light. Yippee! 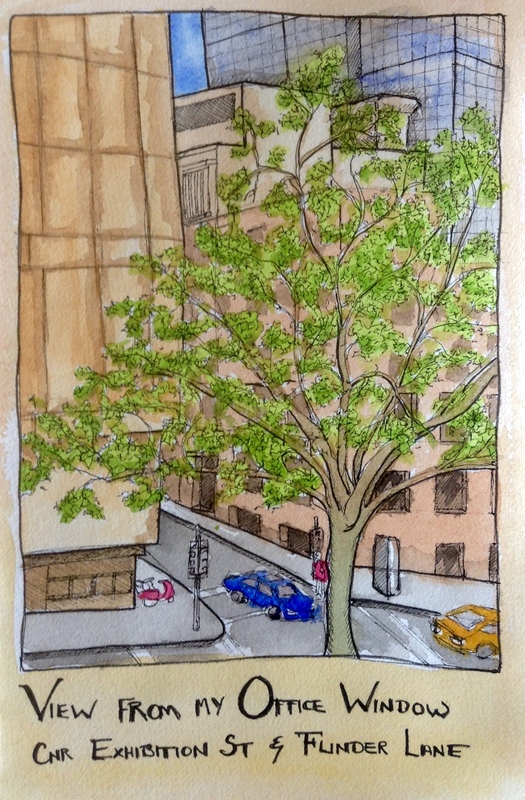 To celebrate I did this sketch out my window, looking at one of Melbourne’s famous plane trees which was just starting to unfurl its leaves.